I must apologize to those who were offended by my post yesterday. It was not intended to whine or garner pity, sympathy or declarations of love. It was just a real post about what I'd been feeling and how things were going. Everyone needs a little space to get stuff like that off their chest, and I took mine. Again, sorry to those who took offense. Now, let's just get to pretty polish. The Milani Retro Glam collection is a soft, gentle creamy pastel heaven! 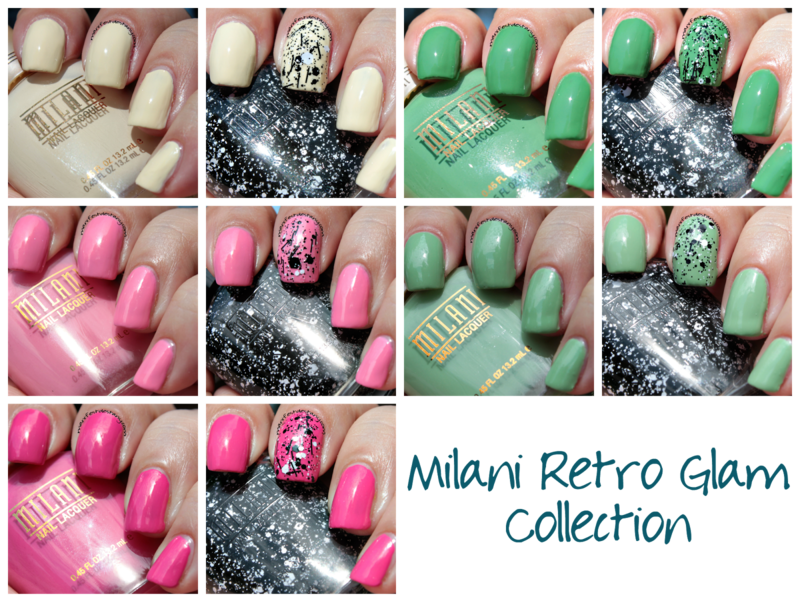 In this collection are 5 creme polishes and one glitter topper - a bevy of black and white hex, circle and bar glitter. It's like Ninja Polish Sticks 'n Stones on a smaller scale, and more densely packed. Check out the photos after the cut! I'll start out with Almond Bliss, a soft creamy yellow-toned neutral color. The formula was great for a lighter color. I got full coverage in three thin coats. I could have gone two coats, and made the coats thicker, but I didn't want it to look too goopy. Next up is Strawberry Shake, a light airy bubble gum-y pink. I was shocked that I actually ended up kind of liking this one! 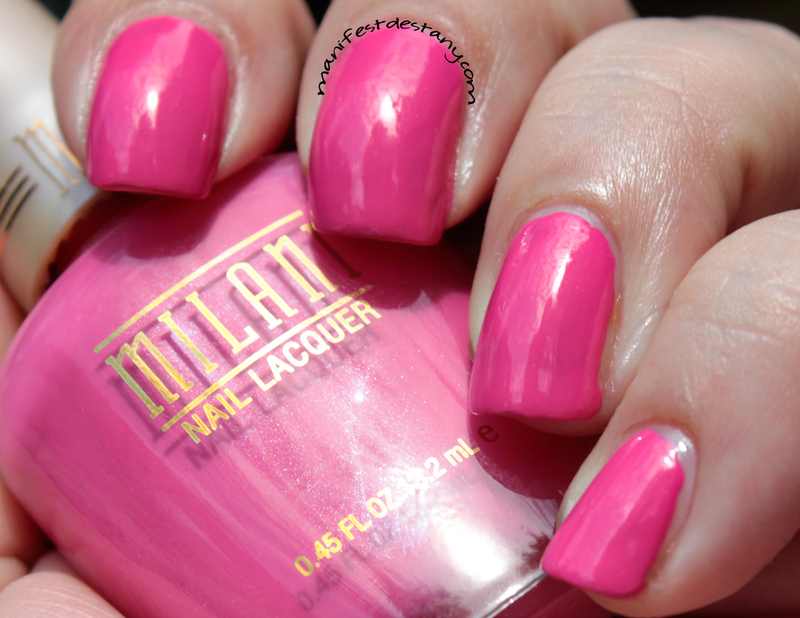 haha You all know I'm not much into pink - but this one...I dunno. I used three thin coats for what is shown. Now on to the greens! We'll start with Creamy Pistachio, a light, almost dusty pastel-ish green. The definite dusty quality to this polish makes describing this a conundrum. It's sort of minty, sort of dusty, sort of pastel. I had a little issue with the formula on this one, as it tended to clump up around my middle finger - see it on the side? No matter what I did, it just wouldn't even out! But otherwise, a very pretty color! Three thin coats is pictured. 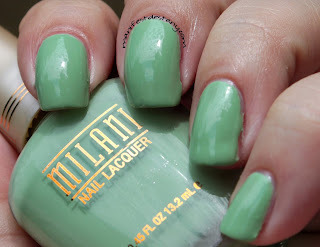 And the last of the cremes is my favorite of this collection - Mint Chip! 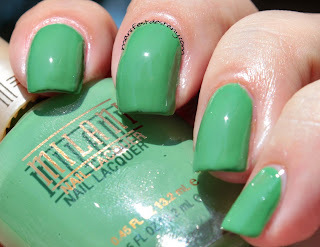 It's the perfect shade of green and it's got the perfect formula. Easily slid right on the nail in perfect form - and it just looks fantastic! I only needed two thin coats to acheive what is pictured, and I ended up wearing this as a mani for a few days, actually! Both collections will be available at select CVS and Meijer stores during the month of August. Please note that some stores might put up the collections before August. Both collections will also be available online.